Evince2019 is a scientific platform under KGHMOA,( Kerala Govt. Homeopathic Medical Officers Assosciation) on behalf of its scientific cell and a stage for developing a scientific language to collate and consolidate on going clinical activities of homeopathic medical officers. Pro active thoughts in every field is a necessary element for updation and progress in every field and to stream line both research and clinical aptitudes KGHMOA have taken a bench mark training programme- DART-H for our aspiring doctors who did a maiden contibution in different areas of clinical parlances. The programme was envisaged as a 3 module training schedule incorporating the steps involved in research. Dr Gopi Krishna. J , Msc, MTec, PhD , scientific communicator from AIMS kochi was our faculty. The selected abstracts will be informed by mail and will have the opportunity to present it in front of the panel of experts.Certificates for the participants and Prizes for the best abstract and posters will be awarded. Last date of submission of the materials will be 30th April 2019. 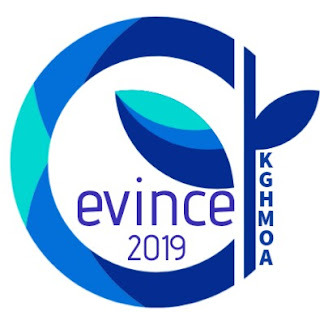 Evince 2019 is scheduled on Sunday, 12th May 2019 at IMA House Kochi, Ernakulam. 1. Fee for registration is 1200 INR. Please specify- for Evince Reg. 2. Venue- IMA Hall, Ernakulam. 3.Time for presentation - 12 + 3 (Q & A) = 15 minutes.